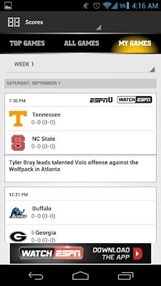 Long-awaited updates to popular apps are usually met with adulation, but ESPN's college football app may be an exception. 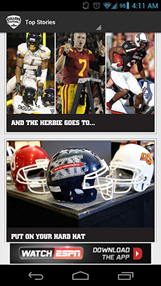 The old Bowl Bound app is now the more generically titled ESPN College Football, with a few new bells and whistles added into the mix. ESPN news for all Bowl Championship Series teams is complemented by video clips that promise to be constantly updated, and users can save their favorite teams for quick and easy access to news and live scores. And here's where the trouble starts. In order to access your favorite teams, you'll need to sign into your ESPN account, or create one if you haven't already. Add to that a myriad of complaints about poor performance and a new cluttered interface, and users of the previous app are not happy tailgaters. There also seems to be some compatibility issues - for example, the app won't download to my AOKP-equipped Galaxy Tab 8.9, but it's showing that it's compatible with the stock version of the same device. 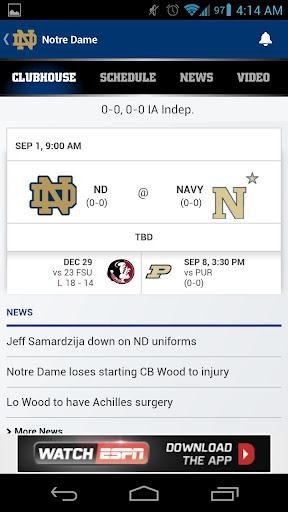 ESPN seems to have flubbed their official app this year. It's a good thing there's plenty of quality alternatives available - including the new additions to Google Now for Jelly Bean users. Available for Apple iOS and Android; Replaces popular Bowl Bound app; Includes up-to-the-minute highlights, scores, news and alerts for all teams. 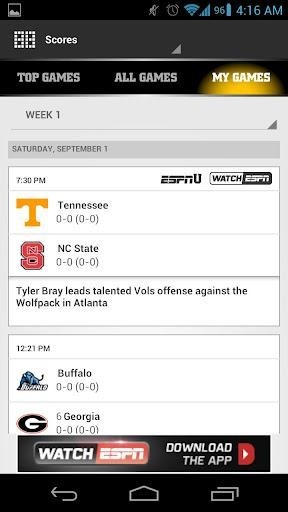 The new ESPN College Football app is now available at the Apple App Store and Google Play Store. 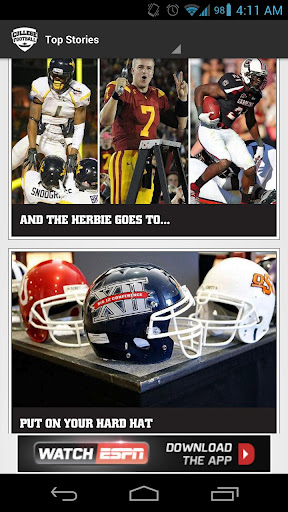 Redesigned from the ground up for both Android and iOS, including an iPad-optimized version, the app will provide fans with unprecedented coverage of the biggest stories in college football and breaking news for all Football Bowl Series teams. The ESPN College Football app is designed to be the ultimate game day companion with up-to-the-minute video clip highlights of key plays from select games, customizable scoreboards and easy access to live games on WatchESPN. The app will also prepare, engage and recap college football fans year-round with enhanced content, including news, video and alerts for all 124 FBS schools. 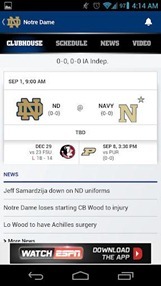 "We think the responsiveness and in-progress elements of the app will deliver a unique and indispensable game day experience for college football fans," said Jay Lee, Senior Director of Product Development for ESPN Digital Media. "We've also combined the unmatched depth of ESPN's college football content across platforms with highly customizable features to keep fans informed and engaged 24/7 year-round, not just on game days." ESPN's Digital Media properties include ESPN.com, the world's leading online sports service; WatchESPN and ESPN3, the company's 24/7 live sports broadband network; ESPN Mobile, which includes the leading mobile web destination and top-ranked apps for iPhone, iPad and Android; as well as Digital Audio, Interactive Games, Fantasy Sports, and other emerging digital media including Grantland.com. ESPN's total digital footprint – ESPN.com, ESPN Mobile web and apps, WatchESPN, etc. – reaches more sports fans each month than any other digital sports entity.